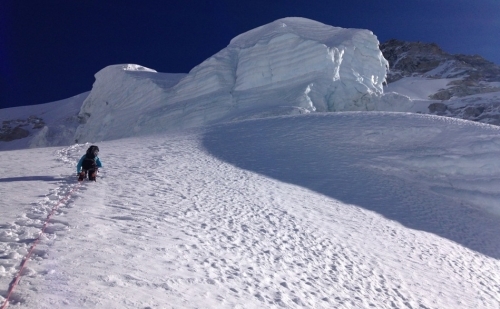 Saribung Peak is newly opened climbing peak in Nepal. Saribung Peak Climbing traverses paths less trodden by outsiders; rugged topography and small ethnic villages through outstanding landscapes forming a photographers paradise. North of Mustang, Saribung (6343m) lies in Damodar, the last frontier from Tibet. 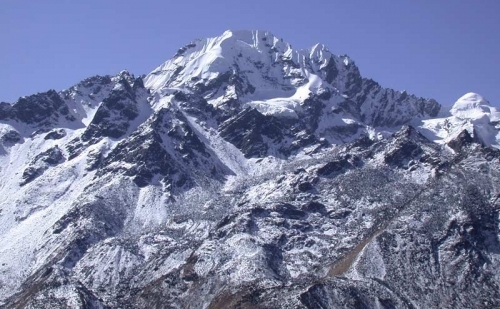 Numerous high points during the journey, including the Saribung Pass (6042m) challenge the mighty. Ancient culture and lifestyle that has thrived in these highlands gives a different meaning to the trek. Saribungs solitary location is attributed by the rugged plateaus and great views. Following the Upper Mustang Trekking route to Lo Manthang, the route then turns on to Namta Khola Valley. This wild area has no settlements, so we have to camp to Saribung and back until we reach Koto. After spending a day for acclimatization in the base camp, we head on to the high camp and then climb the Saribung peak. The trek to Saribung is considered challenging, due to the remote location and altitudinal variances. 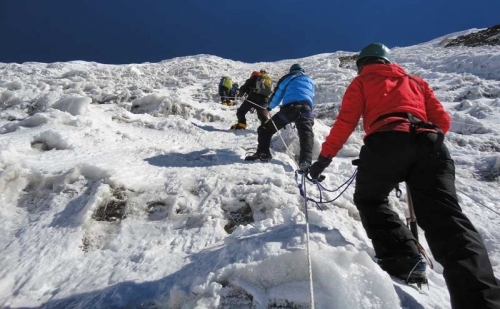 The peak climbing is considered technically easy, but at sections in the ascent, ropes and jumar is used for safety. 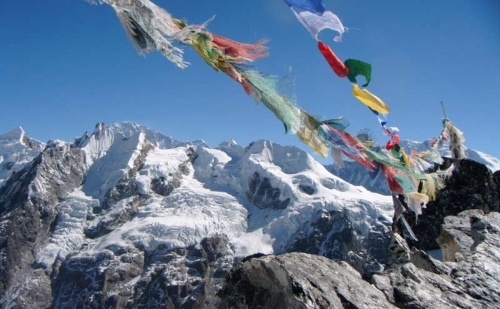 Views of Tibetan mountains including the Peri, Himlung et cetera are magnificent from the least scaled summit. The return route passes through Koto and Dharapani to Besi Shahar where we take a bus to Kathmandu. Stunning views of the Annapurna Dhaulagiri ranges provides inspiration to strenuous walks during the trek. Passes such as Saribung Pass (6042m) and remote valleys in the trek are a rarity, so is the Tibetan culture thriving in this left out settlement. Day 1 :Arrival in Kathmandu (1300m), overnight at hotel Arrival in Kathmandu. Our airport representative will greet you at the Tribhuvan International Airport. A drop to the Hotel by a private tourist vehicle is arranged. You can either take a rest or meet us at our office to know about the details of the arrangements. Dinner at the hotel. Day 2 :Preparation day for climbing permit & briefing, overnight at hotel Free day in Kathmandu & trek preparation. You will get the chance to sightsee inside the Kathmandu valley after having breakfast. The city sightseeing tour will lead you through various landmarks under world heritage listing such as Kathmandu Durbar Square, Syaymbhunath, Bouddhanath and Pasupathinath et cetera. Later, we will brief you about the trek and provide discussion for exciting queries regarding the trek. Day 3 :Drive to Pokhara from Kathmandu. 200km, overnight in hotel Drive from Kathmandu to Pokhara which is around 7-8 hours with an elevation of 823m (2700 ft). We will drive off on a tourist bus early in the morning. The scenic countryside and famous mountain ranges accompanies us through the journey. Pokhara is renowned for views of mountain peaks in the Annapurna range. Pokhara is also attributed with beautiful lakes like Fewa, Begnas, Rupa and Rara. Overnight stay at a lakeside hotel. Day 4 :Fly to Jomsom and trek to Kagbeni 2800m/3-4 hours, overnight in guest house On the fourth day, we will fly to Jomsom on an early morning flight. During the 20 minutes flight, the beauty of the 8000ers is sure to delight you. Jomson valley is a major junction for salt trade route and serves as headquarter of Mustang region. Following the trails along the Kali Gandaki River and the trail passes through Ekley-bhatti village, and hour walk from here leads to Kagbeni. 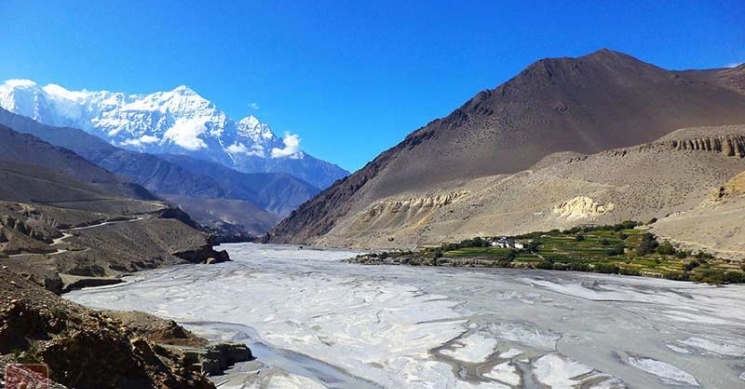 Kagbeni holds special importance as it links Kak Khola with Mustang Khola and forms the great Kal Gandaki river. Overnight stay at Kagbeni. Day 5 :Trek from Kagbeni to Chele 3030m/5-6 hours, overnight in guest houseThe next day is from Kagbeni to Chele which takes around 5 to 6 hours of walking. 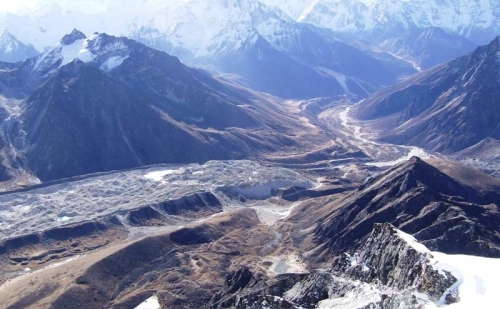 We need to show the permit to move upwards along the Kaligandaki. The trails are windy and sandy, but provide opportunities to view absolute aesthetic sceneries. The uphill and downhill trail will lead us to Tangbe village. The village landscape features white washed houses, narrow alleys, orchards of apple and fields of wheat and barley. Moving on, we reach to Chhusang, and cross the river. We then see a huge conglomerate tunnel through which Kaligandaki flows. Our day ends with arriving at Chele village after passing small ridges. Day 6 :Trek from Chele to Ghiling 3440m/6-7 hours, overnight in guest houseWe walk through small fields of buckwheat along the village ascending through a hill and come to a pass at 3500m. Views of Tilicho, Nilgiri, Damodar et cetera form a panorama here. We then descend to enter a valley and reach a beautiful village called Samar. Then, following the pilgrimage path taking climbs and descends to pass a chorten and ascend again to a pass at 3800m. Here, the first views of Ghiling village can be seen. A gradual descent to a gully and further uphill leads to the village of Ghiling, a beautiful and pristine habitation. Day 7 :Trek from Ghiling to Charang 3490m, 6-7 hours, overnight in guest houseToday, we begin by climbing to the Nya la pass, and then steeply descend to Ghemi. Walking out of the village along mani walled trails, we reach Tramar, a village with red eroded canyon wall towering over it. Further on, after a steep climb, we descend to Lo Gekar where you will find an 11th century monastery. Descending further, we reach a beautiful village with green fields, monastery and a palace, Charang, where we stay overnight. 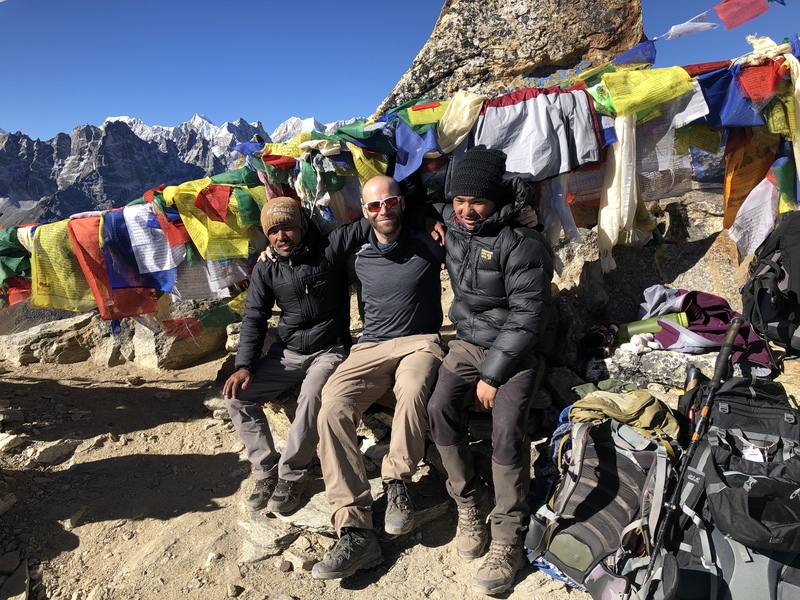 Day 8 :Trek from Charang to Lo-Manthang 3740m, 5-7 hours, overnight in guest houseDropping to the Charang Chu Canyon, the trail then takes a steep climb which becomes gentler towards the Lo pass (3850m) where views of Nilgiri, Annapurna I, Bhrikuti and Tilicho peak are magnificent. The valley of Lo-Mangthang looks outstanding from here with hills towards the Tibetan end. Overnight stay at a lodge. Day 9 :Acclimatization and rest day. Explore cultural and natural heritages, overnight in guest house We spend this leisure day exploring Gombas and viewpoints in the periphery. Namgyal Gompa, a notable monastery that also functions as a local court, is situated atop a hill. The village of Tingkhar lies northwest and is the last major settlement. the Tall Champa Lakhang "God house" the red Thugchen Gompa, Chyodi Gompa, the Raja’s four storey palace, the Entrance Hall and Champa Lakhang are other attractions of this town. Day 10 :Trek from Lo-Manthang to Yara 3900m/6-7 hours, overnight in guest house We leave the beautiful village of Lo to move to Yara. Crossing the pass, the descent is very steep and needs a careful placement of steps. We pass a canyon with eroded cliffs and reach Dhie. Walking down along the colored canyon, we reach Yara where we stay overnight in a guest house. Day 11 :Trek to Luri Cave Monastery/4005m 3-4 hrs walk, overnight in guest house The mostly eroded and desert like landscape leads to a river, which we cross and head to Gangra. It’s a good climb to the top and further on to Luri Cave Monastery perched on top of a cliff. The monastery houses beautiful paintings despite serving as a magnificent viewpoint. Overnight stay in a lodge. Day 12 :Trek to Ghuma Thanti 4600m/5-6 hours walk, overnight in tent After descending through a gorge, we take a well trailed route to Ghuma Thanti. 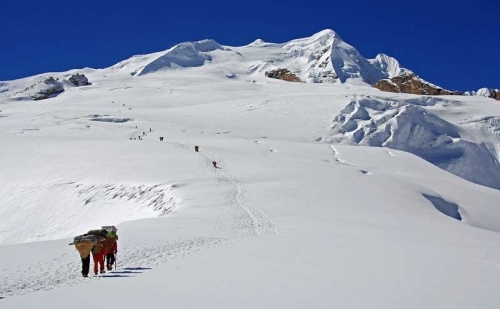 The route crosses pasture lands along hilltops which gives good views of Dhaulagiri at places. We then ascend to a pass at 4940m to descend to Ghuma Thanti, a shelter for Buddhist pilgrims where we stay overnight. Day 13 :Trek to Namta Khola 4890/7-8 hours walk, overnight in tentAfter breakfast, we start along the trail. Due to the lack of cooking facilities and conditions during the trek, we take a packed lunch. It’s a similar course of ups and downs. Upon crossing a high pass at 5600m, we reach the Damodar Kunda, a high altitude lake. We continue along the trail to reach Namta Khola where we stay overnight in a tented camp. Day 14 :Trek to Saribung Base Camp 4950/6-7 hours walk, overnight in tent To the Saribung Base Camp, the trail traverses high altitudes of the Tibetan plateau. As the previous day, we need to take packed lunch due to lack of proper facilities of cooking along the trail. We stay overnight on a tent in the Base Camp. Day 15 :Acclimatization day. Today is free day for exploring the surrounding hills, overnight in tentIt’s a day set for acclimatization before heading to higher altitude. We would be taking a demanding flight in altitude, so this day is very important in other to keep up with the changes in the geography. 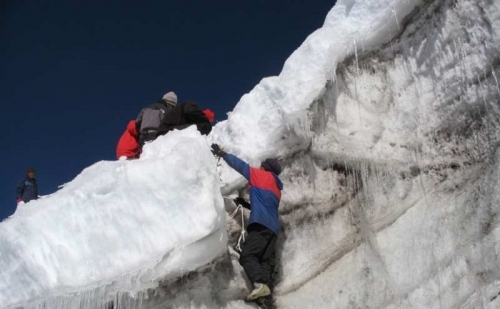 Expeditions to surrounding hills are scheduled to keep the body active and also for acclimatization purpose. Overnight stay in a tented camp. Day 16 :Trek to Camp I 5730m/5-6 hours walk, overnight in tentWe ascend along the moraine of the eastern glacial side all the way to its end, passing along beautiful ice blocks. The path crosses to follow the western moraine at a height of 5700m. Damodar himal and many others form a beautiful array. 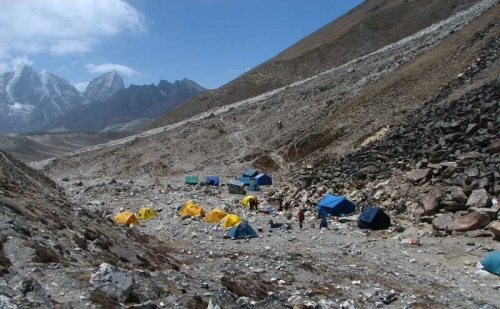 Shortly, the walk concludes at the High Camp where we stay overnight in a tent. Day 17 :Summit to Saribung Peak 6346m and Phedi High Camp 4950m/8-9 hours, overnight in tentIt’s the day to submit the Saribung Peak. We start after an early breakfast in the morning. 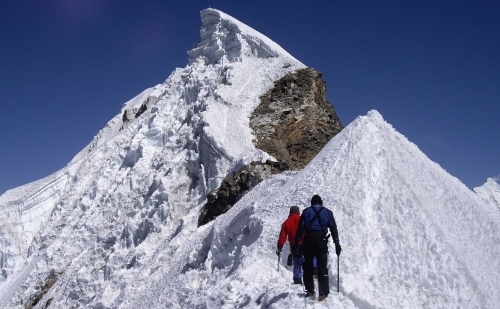 The trail passes through crevassed glaciers leading through snow slopes to reach the top. Views of Gyajikang, Bhrikuti, Himlung and the like form a wonderful panorama here. We then engage in a walk down to the Basecamp, a slow and constant journey. Overnight in a tented camp. Day 18 :Trek to Nagoru 4400m via Saribung Pass 6020m, overnight in tentAfter breakfast, we begin our journey to Saribung pass. It’s a steep and snowy trail to the pass which requires extra caution. We then follow a small stream down to Nagoru where we stay overnight. Day 19 :Trek to Phu Gaon 4080m/5-6 hours walk, overnight in tentThe trail takes along the Tibetan plateau and along barren and eroded valleys, with wonderful views of snow peaks. Phu Gaon is a 5-6 hours walk from Nagoru. The village lies in a hidden valley where culture, religion, ethnic values and natural diversity of different mountain dwellers including Lama, Gurung and Ghale people can be observed. The monastery believed to be the last remaining one constructed by Karmapa Rinpoche, Tashi Lakhang, is also situated here. Overnight stay in a tented camp. Day 20 :Trek to Meta 3560m/5-6 hours walk, overnight in tentWe ascend from the Phu Village and cross the hill to descend to the small villages of Kyang and Chyakhu which are alternate settlements to the inhabitants of nearby villages. The mostly deserted trail then leads to Meta where we stay overnight in a tented camp. Day 21 :Trek to Koto 2600m/6-7 hours walk, overnight in hotel Today’s walk takes about seven hours along the restricted areas of Narphu valley. We follow a rocky trail along the Nar River and forested areas. It’s an adventurous walk that ends at Koto where we stay overnight. Day 22 :Trek to Dharapani 1860m/5-6 hours walk, overnight in hotel From Koto, we move through the Thanchok village and passed forested landscape which ascends to Timang. This place has a beautiful view of Manaslu Peak among others. Down to Bagarchhap, we find good views of Annapurna II. We walk to Dharapani spend the night in a hotel. Day 23 :Drive to Kathmandu via Besi Shahar and stay ovenight in hotelThe drive to Kathmandu takes about 9 hours. We start early in the morning after breakfast. The route passes through Besi Shahar and is an interesting journey with scenic hills and winding paths.